Chapter 880: See What This Is, Xiaochun? When Song Que saw the entranced look on his aunt's face when she looked at Bai Xiaochun, he sighed. By this point, he regretted coming early to visit. The truth was that if he had known Bai Xiaochun would show up, he would rather have been beaten to death than come at this time. Although in some ways he wished he could do something to interfere with Bai Xiaochun’s skills in seducing women, he also couldn’t help but admire him a bit because of it. He had been there to hear all the details Bai Xiaochun had explained about the Win Character Enchantment, which helped Zhao Tianjiao win over Chen Yueshan. And Song Que had also been there to witness the confusing relationship that had developed between Bai Xiaochun and Mistress Red-Dust. And that wasn’t even mentioning Chen Manyao…. Now that he thought about it, all of the most beautiful female cultivators seemed to be in some sort of relationship or another with Bai Xiaochun…. In the end, Song Que could only sigh and muse about how the heavens apparently favored Bai Xiaochun…. He considered revealing the truth to his aunt, and telling her about Chen Manyao and Mistress Red-Dust. But then he realized that Bai Xiaochun was giving him a glare of warning, and his heart seized up. Sighing, he looked at the entranced expression on his aunt’s face, and finally realized that it was a really awkward situation. After blurting out a random excuse, he left. Outside, he felt much better. Shaking his head, he noticed some nearby Blood Stream Division disciples looking at him. At that point, he straightened up, feeling the pride that a chosen Nascent Soul cultivator should feel. The disciples bowed in greeting, and his confidence began to return. Bai Xiaochun and Song Junwan were now alone in her immortal's cave. It was a rare situation. Before, the fighting had been fierce in the battle, but now that they were together, Song Junwan abandoned any attempts to prevent her feelings from showing. That was especially true considering what Bai Xiaochun had told her about Song Que’s situation, and how much danger he had faced to rescue him. Song Junwan could tell that Bai Xiaochun had done all of those things for her sake. And in the end, he had brought Song Que back, not only safe, but also having broken through to the Nascent Soul stage. Gaze warm, she smoothed out some of the wrinkles in his garment, and spoke some sincere words of concern. Considering they were now alone, most of the flush had left her face. Bai Xiaochun felt very relaxed in her presence, and could tell how much she cared for him. Eventually they sat down on a divan, whereupon Bai Xiaochun began to brag about some of the details of how he’d rescued Song Que. Of course, he emphasized his own role in the situation, making sure it was clear that without him, Song Que would probably never have escaped. The entire time, he kept on measuring up Song Junwan. Although they hadn’t seen each other for years, Song Junwan was as spectacularly beautiful as ever. Her makeup was applied perfectly, emphasizing eyebrows that curved as gracefully as willow leaves. Her eyes glittered like pools of deep water, making it seem as if she were waiting for him to guess what she was thinking. Bai Xiaochun’s heart suddenly began to race. Song Junwan was curvaceous and smoking hot, with mouth-watering curves everywhere. There was something shockingly bewitching about her, especially considering how provocatively she dressed. Bai Xiaochun swallowed a few times, marveling inwardly at what a vixen she was. Without even thinking about it, he began to compare her to Mistress Red-Dust, and eventually sighed in the realization that in terms of physique and beauty, Song Junwan clearly came out on top. Suddenly, he realized something. After being thrown down onto the ground in the jungle by Mistress Red-Dust, a new world had opened up to him…. When Song Junwan realized that Bai Xiaochun was secretly checking her out, her heart began to beat more rapidly. A flirtatious expression appeared on her face, and she looked at him closely, pretending she hadn’t noticed the look in his eyes. She also leaned forward a bit, revealing even more curves than before. However, after a long moment, it was clear that Bai Xiaochun was merely looking at her, and wasn’t going to make a move. A spark of anger rose up in her heart, quenching some of her passion. A cold expression even appeared on her face. Bai Xiaochun’s eyes widened in shock. Everything had been going well moments ago, to the point where Song Junwan seemed gripped by passion. But in the blink of an eye, it all changed. It was very strange. Suddenly, he realized that asking about Hou Xiaomei right now probably wouldn’t be the best idea…. Blinking a few times, he decided to feel the situation out. Bai Xiaochun was really confused. Sighing, he mused that women were definitely very strange creatures, both Mistress Red-Dust and Song Junwan alike. “Could it be that all older women are like this?” Convinced that this was the case, he decided that he really missed Hou Xiaomei. She was definitely the most well-behaved of them all. As he did, Song Junwan closed her eyes and ignored him. Bai Xiaochun’s awkwardness was now starting to turn into a bit of anger. Flicking his sleeve, he turned to walk off. However, he only got about seven or eight steps before Song Junwan's voice rang out. Song Junwan opened her eyes and looked at him walking away. As of this moment, she realized that, considering Bai Xiaochun’s cultivation base and talent, it wasn’t reasonable to expect him to stay in the River-Defying Sect forever, even if it was his home. Furthermore, she couldn’t help but wonder… after he left, how long would it be before she saw him again? When she thought about that, and about how distant he had seemed when she caught sight of him on the battlefield, she began to struggle inwardly. If she couldn’t hold on to him right now… then as time passed, they would grow further apart, and their relationship would definitely cool. Eventually, it would probably become nothing more than a memory. The sect had faced many dramatic situations over the years, and she had seen many couples parted by death. Besides, she had no idea if she would be able to break out from the Core Formation stage and into the Nascent Soul stage, which meant that she had no idea how long she would actually live. The only thing she knew was that, over all the years, Bai Xiaochun was the only person to have tantalized her without sickening her. After everything that had gone on between the two of them, he was the one person she could never stop thinking about. At that point, the struggle in her eyes transformed into determination. She was the devilwitch of the Blood Stream Sect, not a member of the righteous and orthodox Spirit Stream Sect! As her hesitation vanished, decisiveness enveloped her. She stretched out on the divan, making sure every inch of her beautiful figure was on display. Then she spoke in a voice that would stab deep into the heart of anyone who heard it. As soon as her voice entered his ears, it felt like a hand had grabbed onto his heart. After shivering for a moment, he snorted coldly. “Whatever it is, I don’t want to see it!” Those were the words which left his mouth, and yet, he stopped walking, and even turned around, to see Song Junwan reclined sultrily on the divan. His heart began to pound even harder. However, he reminded himself that in the face of a vixen like this, he had to control himself and act like normal. Covering a smile with her hand, she looked up at him, snagging his gaze as surely as if with a hook. Even as he gasped in surprise, she patted her bag of holding, producing a medicinal pill which she held up in two fingers. Bai Xiaochun’s jaw dropped, a bit displeased that this was what Song Junwan wanted to show him…. It turned out it was just a medicinal pill. Sighing, he looked a bit closer, drawing upon his skill in the Dao of medicine to identify it. 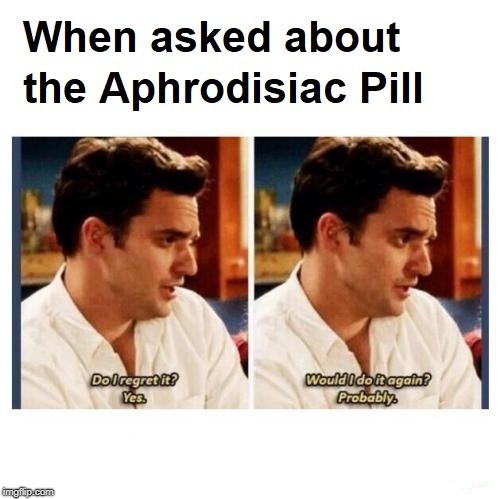 “Oh, it’s an Aphrodisiac Pill. Hey, how did you get--” Suddenly he gasped, and thought back to Mistress Red-Dust. Hey everyone, I noticed the discussion last chapter about the issue of when Hou Xiaomei left for Heavenspan Island, and the seeming discrepancy between 877 and 879 about when that happened. I double checked the Chinese to make sure I didn't make a mistake, and in fact, did not. This is how Er Gen wrote it. My suspicion is that it's a mistake, however, as one reader pointed out, it is plausible that the competition could have taken place ten years before the winners were taken away. For now, I'll leave it as is, and consider changing it later during final editing for the published version.